Quite a few of Maine’s sixty-plus lighthouses are offshore on islands, making them accessible only by boat or visible only from the air. Cape Neddick Light is one of a few that are on islands, but are easily viewed from shore. Cape Neddick Light is on a small island known as “The Nubble”, just offshore from Cape Neddick Point (in the village of York Beach, strangely enough, not in the village of Cape Neddick). The lighthouse was first established, and the lantern lit, in 1879. 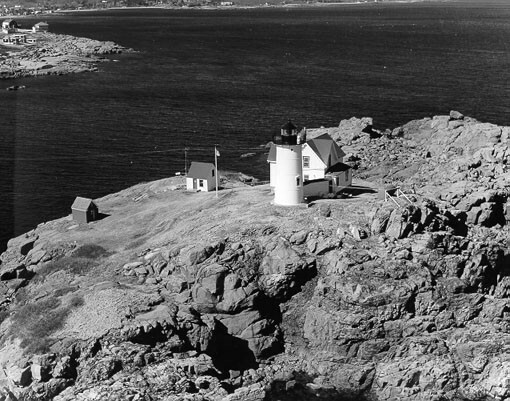 There had been talk of putting a lighthouse on the Nubble since 1807, but even with later wrecks, the decision was that there were enough lighthouses in the area to protect shipping. One of the wrecks, the Isadore, wrecked nearby in 1842, is still said to appear as a ghost ship with a phantom crew. Perched high on the rocky island, the 41 foot tower puts the light 88 feet above sea level, with its red beacon above the white tower. At low tide it was sometimes possible to walk between the mainland and the island, but the usual way of crossing was by boat, often tethered to a line across the channel. Supplies (and sometimes people) were transferred by a large bucket suspended from the cable. The lighthouse was a tourist attraction from the beginning, with some keepers earning extra money by ferrying tourists to the island. The keeper’s house and tower are decorated with white lights for the Christmas season. However, since there are many more visitors in the summer months, the town of York, who maintains the light station, also decorates it again in July. 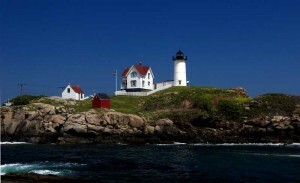 The Nubble is a bit less than an hour drive from Brewster House Bed & Breakfast, and our guests often enjoy a day trip to Cape Neddick, with side trips to Kennebunkport, Wells, and sometimes Kittery.